Eddie is actually my favorite character in Hope Is a Ferris Wheel, and even in the Sixth-Grade Delinquents story. My favorite characters are the ones who are very contrary. The basis of Eddie’s character is that he’s a “bad” kid who is slowly realizing that he doesn’t have to be a bad kid. I won’t give away too much of Eddie’s backstory, but if you’ve read the book you know that he thinks he’s stupid, because that’s what people have been telling him for a long time. DESPITE the fact that he has a bunch of poems memorized, and DESPITE the fact that he’s reading a thousand-page novel to himself in his free time. Here is the earliest picture I have of Eddie, who predates every other character in Hope Is a Ferris Wheel except for maybe Miss Fergusson. In the Sixth-Grade Delinquents story, Eddie was the top delinquent. He’s the one no one else would dare challenge, because he’d been beating up other kids since like, the second grade. But Eddie wasn’t a dumb bully, he was a smart bully, and he’d already figured out how to play sixth grade. This is a picture of Eddie and Denny in sixth grade. They were part of a group, and I won’t say anything else in case I ever end up writing that story. But you can see here how smug Eddie looks, like he’s got everything figured out. Which he does. But fifth-grade Eddie is a lot less confident and much more insecure about his intelligence. 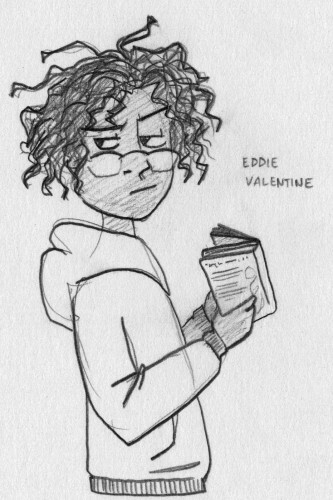 (If you’ve read the book – you’re right, Eddie doesn’t wear glasses. He gets them right around Thanksgiving, right after Hope Is a Ferris Wheel ends.) 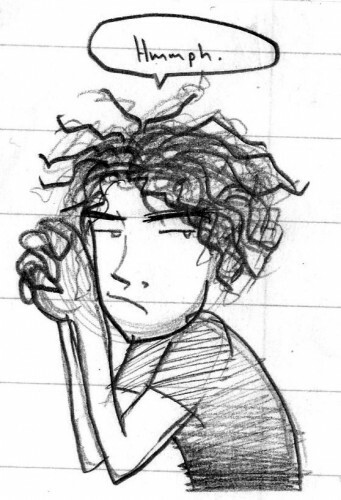 (Oh, and yeah, his last name is Valentine, which is never mentioned in the book since he’s not in Star’s class.) Also, you can see that, since that first picture, his hair has expanded quite a bit, and that I got a lot better at drawing it. So, Eddie’s tough and a bully. And a major reason of why he’s a tough bully is Langston. Langston is not in the Sixth-Grade Delinquents story at all, because at that point he wouldn’t be a sixth-grader anymore and wouldn’t go to the same school. But in the story, there were a lot of rumors about him. The administration of Pepperwood Elementary sees Langston as the ringleader and Eddie as the sidekick, even though it’s actually the other way around. But Langston and Eddie do feed off of each other. Langston likes being a bully, making fun of other people, feeling like he’s in charge of things, even if it’s just his own thing he’s in charge of. Above are early pictures of Langston looking a lot meaner than he actually is. 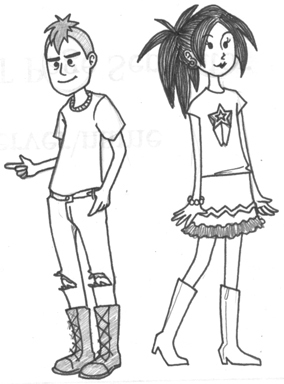 I gave Langston a mohawk because I’d taught some kids with mohawks, and I noticed a couple things about these kids that I wanted to convey in Langston’s characters. Langston’s a good foil for Eddie. Eddie is perceived as stupid but is actually very smart, while Langston is perceived as stupid and is actually stupid. But it doesn’t bother him the way it bothers Eddie. Langston’s also very cocky where Eddie is insecure. 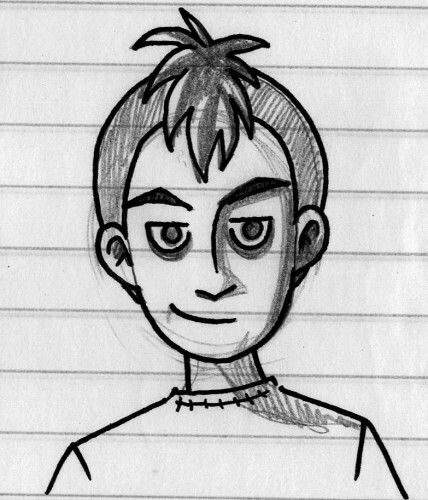 Langston is pretty easy-going while Eddie has a short temper and tends to be angry and hold grudges. And even though Eddie’s smarter than Langston is, Eddie’s the one who was held back in first grade, not Langston, and Langston holds that over Eddie’s head quite a bit. And in case you’re wondering, Langston’s last name is McNeilly, which again isn’t in the book since he’s not in Star’s class. 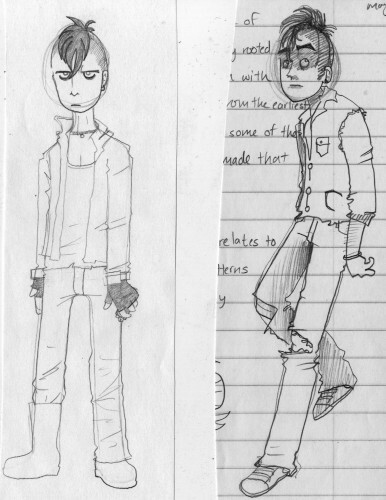 I drew the above image around the time Langston started being more involved with the plot. And also when Star would wear a ponytail to disguise her mullet. And I guess wore fancy zip-up boots? Oh, wait. I remember why I drew those boots on her – because Langston was already wearing combat-esque boots and I thought it would seem odd if they were both wearing them. Oh, and one more little tidbit: Langston didn’t have a name until I think draft 2. The kids in the Sixth-Grade Delinquents story referred to him as “Firestarter” for reasons I won’t get into. And then he didn’t have a last name until draft 3. Now that I think about it, Langston might predate Eddie. The idea of a kid called Firestarter has been in my mind for a long time.